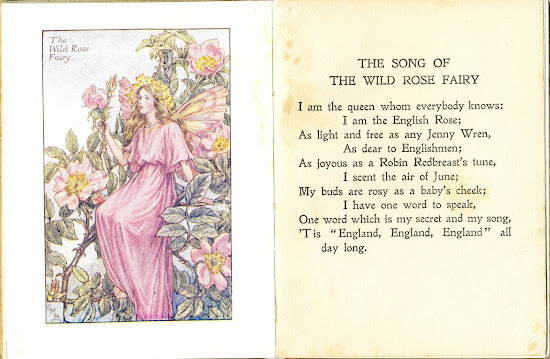 I received this guest post from Ireland a while back, but only this morning did I fully read it and man-oh-man am I sorry now that I gifted my Flower Fairy books to a friend with girls. The Flower Fairies were some of my favorite books as a child, and now I'm going to have to see if my mother will send along the originals. Perhaps there might have one last chance with my son before he is lost forever to boyish things. My six-year-old was tucked in on my left, browsing through something while listening to me reading The Berenstain Bears Get the Gimmes. Much as I love bedtime stories, I was rushing. My husband was waiting downstairs with a tub of ice cream and the second series of The Wire on box set. I glanced over his shoulder expecting to see our Bionicle 2008 Annual or the Green Lantern graphic novel borrowed from the library. 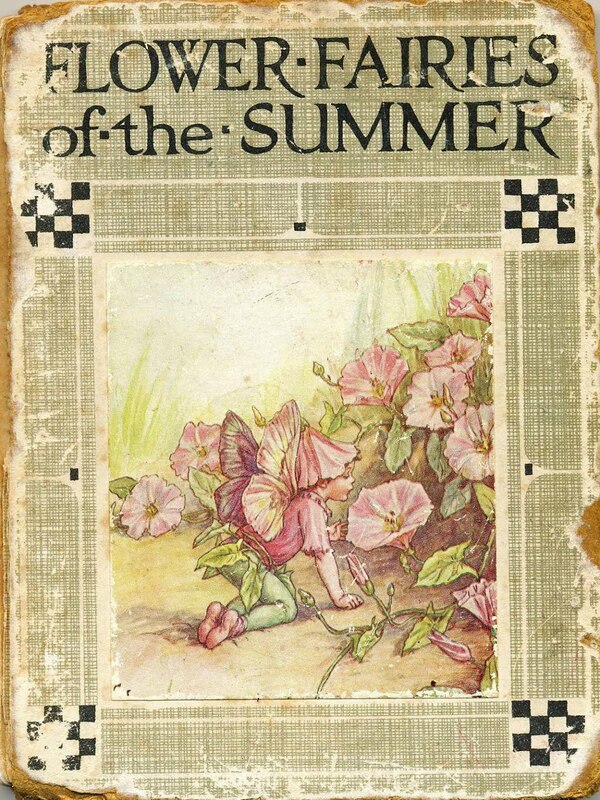 But no, he was looking at Flower Fairies of the Summer by Cicely Mary Barker. 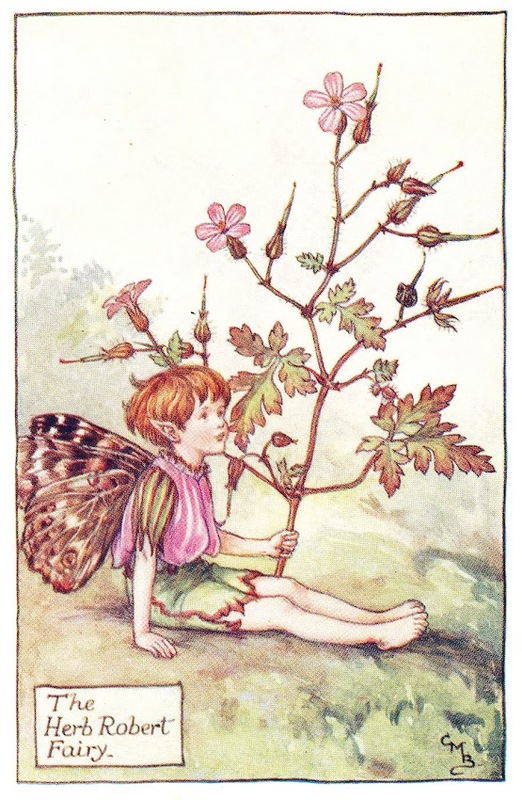 His favourite guy was the Herb Robert Fairy. I have four sons, and they are wonderful. However, one (tiny, unimportant) downside for me is that I have had to accept that they will probably never read Rumer Godden's Miss Happiness and Miss Flower. Noel Streatfield's shoe books don’t feature on their bookshelves. It’s okay, I’m over it, we have Nicholas and Emil and Ira and Homer Price. Still, when I saw what he was reading, I was very happy. 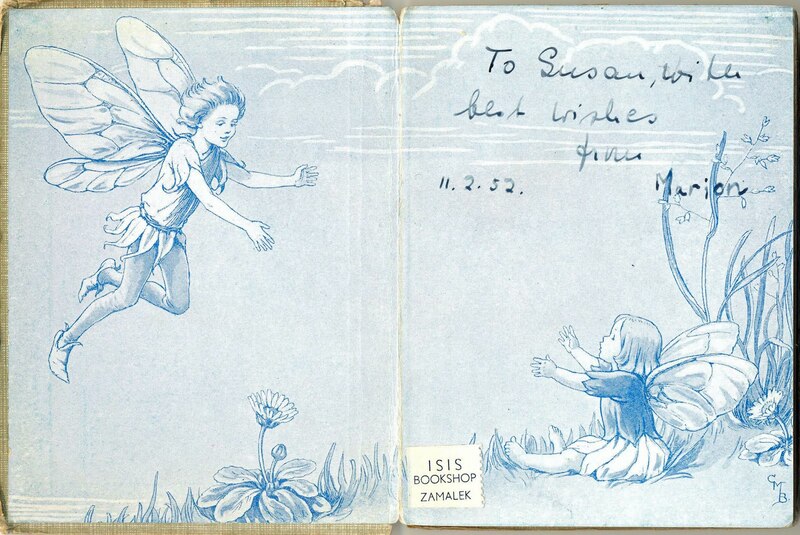 Anyway, prior to this, the Flower Fairies had come with Sue, my mother-in-law, from her family home in London when she met and married my father-in-law in 1966. Before that it came from her previous home in Egypt, where she lived until she was eight. The label from Isis Books in Zamalek is still on the inside cover. Zamalek was a district of Cairo on an island on the Nile. There it was purchased by Sue’s parents for her Aunt Marion who wanted to give her something special for her eighth birthday. 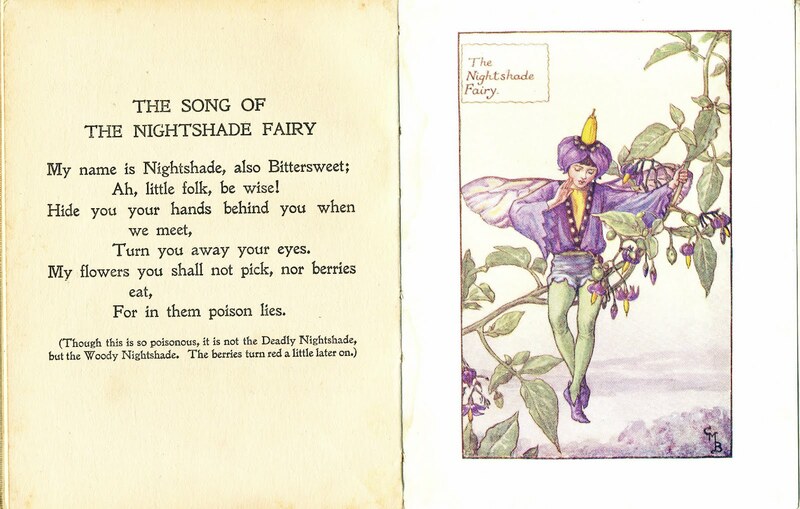 It goes without saying that the illustrations are delicately beautiful but another thing I love about them is that all the flowers featured are wild. My mother, a biology teacher and botany nut, loved wild flowers. During summers in the west of Ireland she taught me all their names. Birdsfoot Trefoil, Vetch, Harebell, Sorrel, Yarrow and more. Mum favoured the tiny, less obvious ones, the ones that didn’t grow on and suffocate other plants. So, the Scarlet Pimpernel and Gentian were never picked, only admired. Convolvulus was torn from whatever it was climbing on. Reading the book now, I remember her enthusiasm, and when I dig out her reference books, flattened, dried leaves and petals fall from their pages. It makes me sad that I cannot ask her more now and happy that I can at least remember some of it. 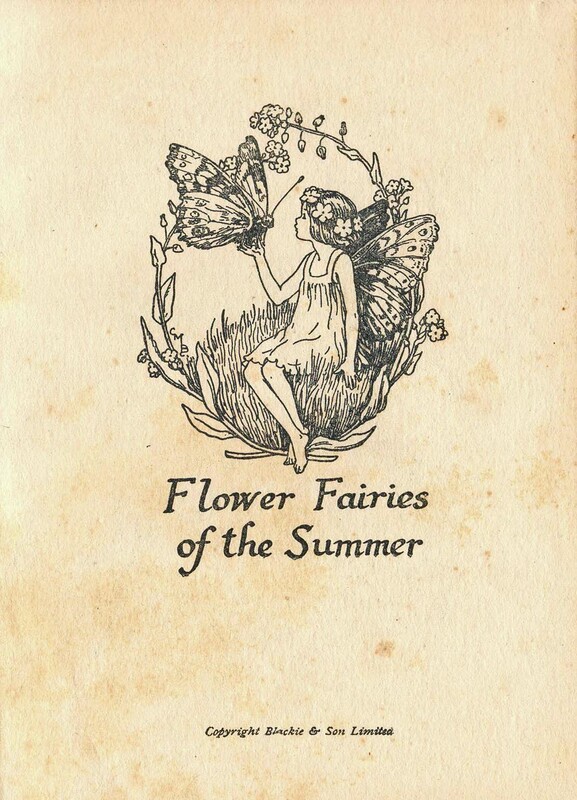 Flower Fairies of the Summer is well read, the spine long gone, the cover worn at the corners, having been studied and enjoyed many times. Both by little girls and little boys. Cicely Mary Barker's illustrations are so beautiful. How wonderful to see a little boy enjoying them, too. If you ever find yourselves in Ann Arbor, MI, check out the extensive collection of fairy doors, villages and stores throughout the city (http://urban-fairies.com/). I went to a bed and breakfast once where the proprietor had cut the pages out and framed them throughout the house. I love the Flower Fairies too! My shiny new copy needs to get off the shelf a little more. I suppose the lesson I have leaned here is that there is something sad about a children's book that has never been held in a child's sticky hand. I need to take a deep breath and let the kids at my pristine children's books... before it is too late! Found this page as I was preparing a thank you note for my English teacher who will retire this week. She gave me a Flower Fairy book when I graduated 23 years ago. Love it, and yes, love that it is about wild flowers. I am currently working on opening a bookstore, will sell these for sure and will continue to follow your blog for more tips. 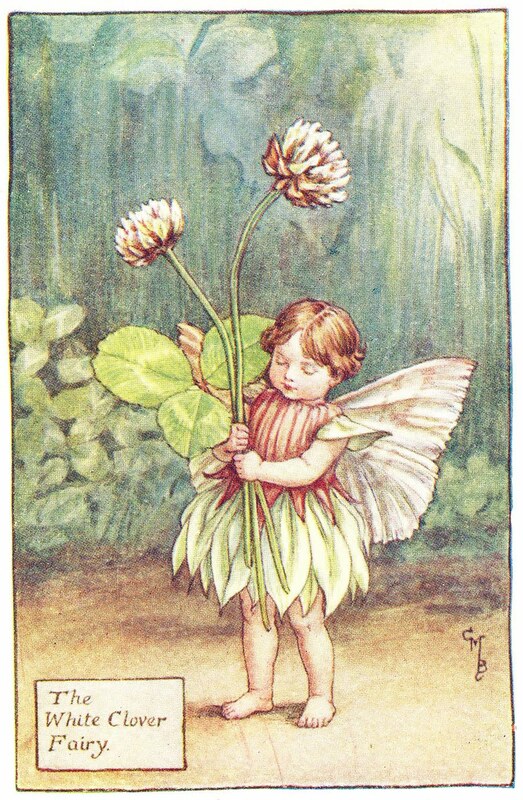 Flower fairies looks like a good design for christening dress or for flower girl dress. Their innocent look suits those types of dress.